Whenever I approach my husband to ask him what I should wear or I complain about not having anything to wear, he always says, just wear a LBD. Yes, he literally says LBD and is so proud of himself for know what that is haha. Gosh, I love that man. Anyways, whenever that happens I always realize that I've never really owned a little black dress that I've actually loved! Sad! Every woman should own at least one LBD that they really love and feel great in! So this week I am bringing you four different little black dress looks! This first one is great for the Holidays! Especially New Year's Eve! Those sequinned elbow patches are so fun and the fabric of this dress is SO comfortable! So you can get your party on all night long!! Pair it with some awesome jewelry and whatever pair of coloured tights and there you have it! 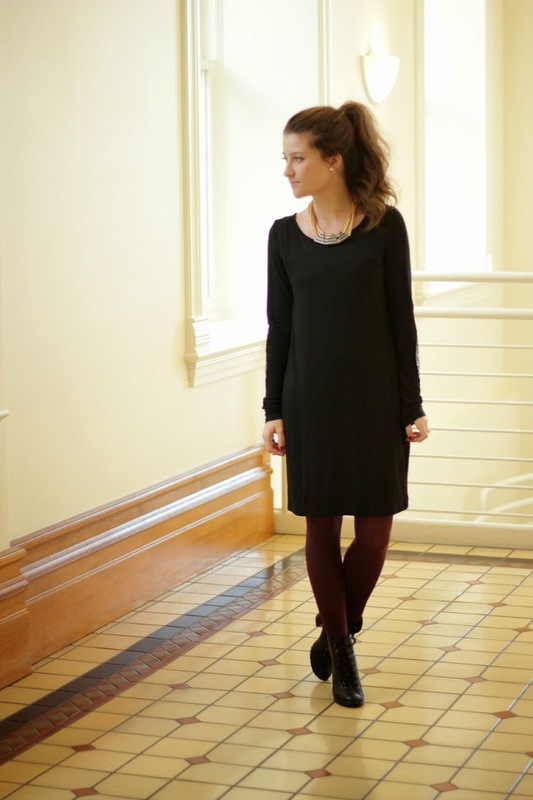 A perfect LBD outfit! Who is ready to party with the upcoming Holidays just around the corner?? I love those sequin elbow patches! I love this look, and you seriously have the prettiest hair!